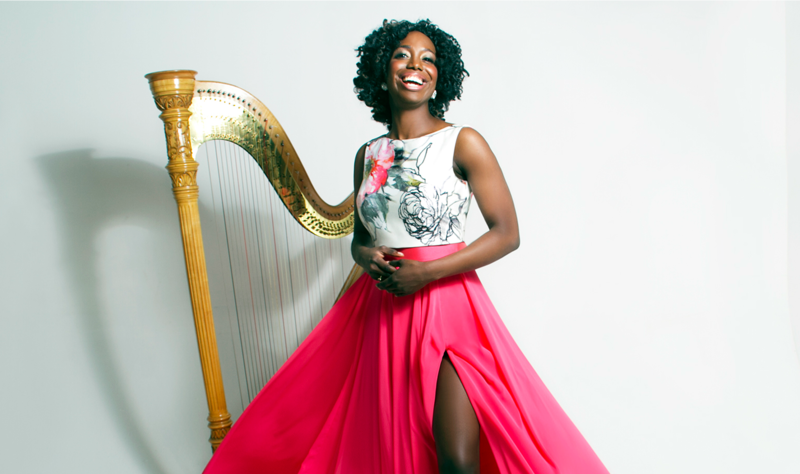 New York, New York — Genre-defying harpist Brandee Younger proudly announces multiple New York dates through March and April, 2018. During this string of performances, Brandee will be collaborating with a melting pot of esteemed musicians including Courtney Bryan, Ravi Coltrane, Dezron Douglas, Johnathan Blake, EJ Strickland, Rashaan Carter, Wendy Kerner, and Teresa Mango. Younger is considered one of the leading harpists of her generation. Recently, Younger led a trio of harpists alongside the incomparable Moses Sumney for a stirring rendition of his single “Quarrel”. A regular collaborator with Sumney, Younger’s haunting contributions are chronicled on a rare live performance for The Fader which is viewable here via Revive Music and below. In addition to her work with Sumney, Younger recently participated in “Monastic and Ecstatic: A Glimpse into the Life and Legacy of Alice Coltrane” at MOMA PS1. This 6 hour event on the life of Alice Coltrane featured presentations, performances and lectures by Brandee Younger, Ravi Coltrane, Michelle Coltrane, Ashley Kahn, Laraaji and Kelsey Lu. To kick off this new series of shows, the Schomburg Center for Research in Black Culture, located at 515 Malcolm X Blvd, New York, will proudly welcome back Younger for the Annual Women’s Jazz Festival on Monday, March 5th at 7pm. In the 40th Anniversary of the release of Alice Coltrane’s ‘Transfiguration’, the festival will feature a special performance in celebration of the expansive genius of Alice Coltrane, her impact and legacy as an indelible artist and visionary whose work was both pioneering and continues to impact and influence music today. Younger will present this homage to Coltrane, curated by ethnomusicologist Aja Burrell Wood alongside pianist and composer Courtney Bryan, drummer Johnathan Blake and bassist Rashaan Carter. Tickets are available here. On Friday, March 9th, the Tilles Center for the Performing Arts, located at 720 Northern Blvd, Brookville, NY will present Brandee Younger, alongside bassist Dezron Douglas for an intimate, duo set. Younger and Douglas will perform a 9pm set in the Goldsmith Atrium. Tickets are $10 and include drinks and light snacks. The option of a buffet dinner is available for an additional $15. Find out more information and buy tickets here. On Friday, March 23rd Younger will bring her trio to the Elebash Recital Hall at CUNY’s Graduate Center, located at 365 Fifth Avenue, New York for a free concert performance in celebration of black women in jazz at 6pm. The leading voice on the life and music of both Alice Coltrane and Dorothy Ashby, Younger will present trio and solo works by both pioneers as well as her own original works, alongside Rashaan Carter on bass and EJ Strickland on drums. Find out more information here. On Friday, March 30th Younger will bring the month to close with a guest appearance with saxophonist Ravi Coltrane and his trio at The Jazz Standard, located at 116 E 27th St, New York. Performing two sets (7:30pm & 9:30pm), alongside Coltrane, Younger will join Dezron Douglas on bass and Allan Mednard on drums. Tickets are $35 and are available here. Finally, on Sunday, April 8th, Queens Library, located at 89-11 Merrick Blvd. Jamaica, New York, will welcome Younger alongside fellow harpists Wendy Kerner and Teresa Mango at 3pm. Kerner and Mango, known as “A Two Of Harps”, commissioned Younger to compose an original work for their harp duo. The original piece, along with selections from the contemporary classical, popular, and jazz repertoire will be performed. Find out more information here. As an additional reminder, Younger will be performing as part of the Lyon & Healy Summer Concert Series this June in Chicago, IL. Taking place June 6th through the 9th, Younger will be participating in the prestigious event alongside esteemed harpists Emmanuel Ceysson, Lavinia Meijer, and Katherine Siochi.